Three boys grow up together with a wealthy family. Whilst young, one of the boys overhears his mother discussing the sale of the "Blue Sapphire", a jewel that belongs to the family. It is replaced with a fake and the household continues on. Many years later the family is in financial trouble and the sale of the "Blue Sapphire is discussed". Knowing it is a fake and wanting to save their mother from the shame it is stolen moments before being revealed during a black out. The boys are given to the morning to own up but when morning comes the eldest has left a note confessing and has gone to join the foreign legion. His brothers, knowing his sacrifice, also leave notes confessing and join the legion. The three brothers are stationed together until the middle one is sent away to separate the three. The general in charge of the outpost is considered a mad man with no respect for the dead. His plan is to prop dead soldiers up on the walls so the Arabs will think they have lots of men. When one of the brothers is killed the other fights to have his body respected and buried instead of used and shot up. With the return and subsequent death of the middle brother just moments before a final attack,the youngest is the only one to make it home back to his mother. Three adopted English brothers join the French Foreign Legion in North Africa, after one of them steals their adoptive family's famous heirloom sapphire. The story had such good potential, but the talents of the leading actors were simply wasted. Future Academy Award winners, Gary Cooper, Ray Milland, Robert Preston, and Susan Hayward, unfortunately, were given scripts that were totally amateurish and wooden. By strange irony, however, Brian Donley is brilliant as the sadistic sergeant Markov. Blessed by a powerful script, Donley gives one of the finest best supporting roles in Hollywood history. Whenever I watch this movie, I often just fast forward to the scenes featuring Sgt. Markov ... so deliciously evil with his cocked eye and imposing demeanor. How different adventure movies from in the 1930s are from their counterparts today. Honor, loyalty, bravery, sacrifice...what concepts! 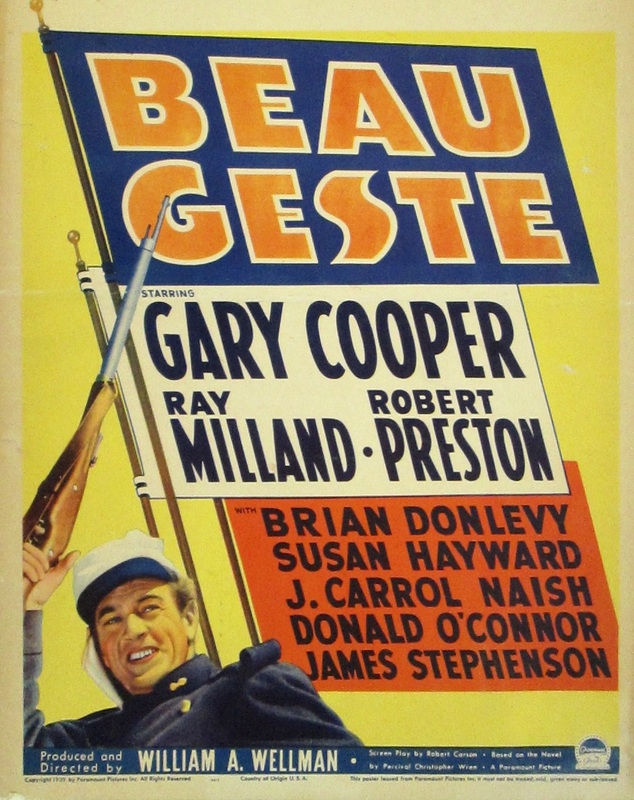 Beau Geste has them all in spades. A very interesting story, this movie is as much a mystery as adventure story. It spans 15 years, following three adopted brothers from their childhood in an English manor house to their membership in the French Foreign Legion and their stationing at a fort in the remote reaches of the Sahara. If you are tired of the paperthin, hole-ridden plots of today's action movies that rely on CGI and special effects instead of story, then this movie is for you!